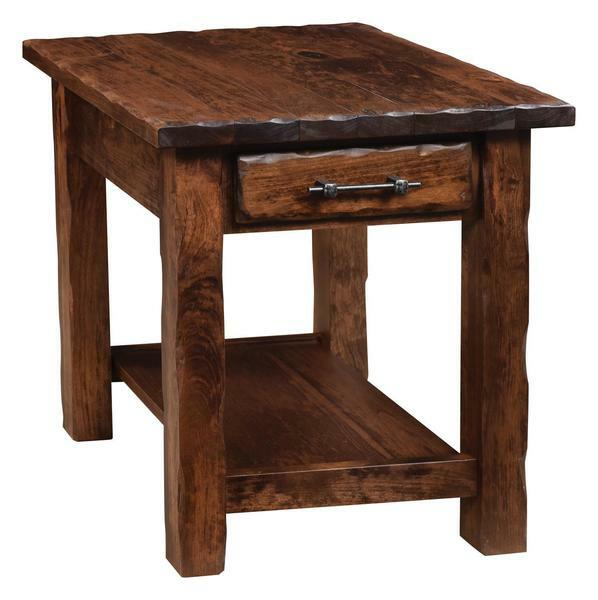 No matter your style -- rustic, farmhouse, contemporary, country, Southwestern -- our Amish Hand Hewn End Table with One Shelf could find a place in your home. The clean, contemporary design with a 1 1/4" thick top, one dovetailed, fully extending drawer, four square post legs, and an open shelf gets a touch of rustic when our Amish woodworkers take a thin, rounded blade and add knicks and indentations to planks of wood that make up the design to simulate the appearance that the piece was made from a well-worn barn floor. Place this occasional table in a living room, office, or use it as a night table in a bedroom to create a spot for a lamp, a place to set a coaster with a drink glass on top or book. Place a basket with smaller items or a rolled up blanket on the open shelf to keep any room organized or cozy items handy. Available in a variety of wood, finish, and hardware options, this accent table is shown in Rustic Cherry with FC-7136 Tanbark stain. Shown in Rustic Cherry FC-7136 Tanbark.